ATLANTA – Football can be fun again. Let No. 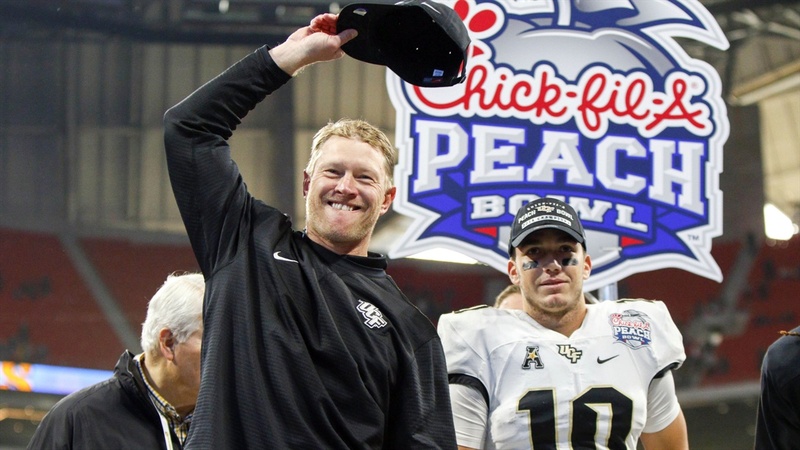 12 Central Florida’s Peach Bowl win over No. 7 Auburn and its 13-0 season serve as the official unveiling, but Scott Frost, his coaches and players have been working on this monument to fun for two years now. Yang Yang is a giant panda at Zoo Atlanta who picked the Tigers to win in one of those made-for-TV events, but part of the reason UCF will finish the 2017 season as the only undefeated team in college football is because it refuses to take anything too seriously. At least that was the takeaway after following this team and Nebraska’s next head coach to Atlanta. I won’t pretend to be an expert on the Knights after spending five days around them, but it is the one thing that was common in every interview and interaction over the week leading up to the game. That wasn’t an accident. It was part of the plan. For most of 2017, there was no stopping the party. Entering the bowl game UCF had outscored its opponents by an average of 24 points a game (fun), put up nearly 50 points a game (also fun) and won three one-score games over the final five games of the season (really fun) to claim the conference title. Auburn, of course, was a supposed to be a different challenge. The Tigers were SEC West champions. They had beaten two Playoff teams (Alabama, Georgia) and played another (Clemson) within eight on the road. And Auburn was a different challenge. UCF’s offense was bottled up in the first half. McKenzie Milton, the most efficient quarterback in the country not named Baker Mayfield, was 3-for-17 passing. The high-flying, lightning-quick, UCFast offense was limited to, basically, Milton making plays with his legs. It wasn’t how the Knights prefer to play, but it was enough to be hanging on to a 10-6 lead with 38 seconds remaining in the second quarter following an Auburn field goal. As someone who covers Big Ten football for a living, it’s hard to count the number of times I’ve seen a team kneel on it and take a four-point lead into the half under similar circumstances. But this is UCF and its mission statement seems to be “what the hell, it’s just football.” So the Knights threw, incomplete, then Milton ran for 15, then threw for 16, threw incomplete again, then ran for 11 and UCF got a field goal before the half. There would be more examples of that indifference to the odds and conventional thinking. Trailing 20-13 late in the third quarter, UCF faced a third-and-8 at its own 37. Against a defensive line stacked with NFL talent, the Knights emptied the backfield and threw for 26 yards. Up 34-27 as the clock ticked under 4 minutes remaining in the fourth quarter, UCF faced a second-and-8 near midfield. Run it and keep the clock moving? Nah. Milton dropped a beautiful ball over an Auburn defender to tight end Jordan Akins for 30 yards. That drive ended in a missed field goal and the Knights would need an interception to put the game away, but it’s the thought behind that initial throw that counts. Or maybe it’s the lack of second-guessing. Or maybe the immense confidence. Not just to make those particular calls, but to beat a team like Auburn when the Tigers had really created the type of game they needed to create to win. If you asked me to describe what Nebraska football was like over the past decade, I’d say it was complicated. And often angst-ridden. There were highs and lows, near misses and blowouts, hope and despair. But underneath it all was the constant worry that maybe the good times were really over for good. UCF doesn’t have to carry that weight. It is a program that continues to make a case – and a pretty convincing one – that it could be a national power if the powers that be would only let it. But even if that weren’t the situation, I’m betting the Knights would refuse to carry that particular weight anyway. The weight’s not fun, and UCF doesn’t have time to not have fun. It led to a remarkably quick turnaround in Orlando. It feels like just the thing that’s needed in Lincoln now. Who knows how long it will take this time? It drew a big smile from Milton, the offensive MVP of the game, and a laugh from linebacker Shaquem Griffin, the defensive MVP. One of the bowl representatives in the room noted that they could schedule UCF and Nebraska in the kickoff game, also sponsored by Chick-fil-A, that takes place in Atlanta each year. “Pump your brakes, pump your brakes,” said Frost. It was a joke. This staff doesn’t believe in slowing down. Now it’s time to get Nebraska up to speed.